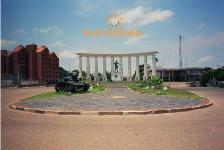 City tours can be taken individually or in groups offered by most travel agencies and tour operators. Most of the better hotels also offer them on their own. There are many interesting sites to see within the city of Santa Cruz de la Sierra and even more regional sites nearby. Many of these make for a nice day trip and others, just slightly farther from the city may necessitate an overnight stay. There is something for anyone’s taste in travel or leisure. The following are some city sites you can visit on your own without the need to pay for a guide. Most city tours will likely take you to the Plaza 24 de Septiembre soon after you arrive. The city is built in concentric circles called rings that extend out from this plaza. You can read more about the city and its history on my page about the State of Santa Cruz here. Back to Santa Cruz city: at this plaza you can rest, play chess on one of the many permanently installed chess tables (bring your own pieces), walk around and people-watch, or for under $1 dollar you can climb to the top of the cathedral clock tower where you'll be able to see out over much of the city. It's a great place to take photos and at the very top you can actually see the clock that rings the bells every 15 minutes. On the southeastern corner of the plaza you’ll immediately see the Catedral de San Lorenzo (St. Lawrence Cathedral) which has a beautiful interior and is over 400 years old. One of its main attractions is its Museo de Arte Sacro (Museum of Sacred Art) inside, where you can view centuries-old gold and silver religious artifacts. You might also be able to convince one of the priests to let you visit the catacombs, deep down under the church. You can also climb the clock tower. Behind the church on the other side of the block is another restful plaza. In between the two in the conjoining building, is Santa Cruz' hippest, happeningest art gallery Manzana Uno. This is not usually part of the typical city tours, but the second concentric city ring (Segundo Anillo) has several roundabouts similar to the ones you’d see in Paris. Each time you get to a roundabout (called rotondas) you know you’re at the intersection of a major avenue that crosses through the concentric rings like the spokes on a bicycle wheel (consider the main plaza the wheel hub). Each of these roundabouts has a small plaza and a statue which marks a historic personage or point in the city's history. It’s an interesting one-hour city tour to take a taxi and circle the entire Segundo Anillo, although because of traffic congestion on work days I suggest doing this on a Sunday when you can actually stop and get out to see and photograph each one. 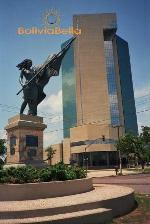 On the Eastern side of the plaza there is a large 3-storied building called Shopping Bolivar. This is one of the main shopping malls in Santa Cruz. There are arcades, clothing, high-tech and hobby shops, and several very large souvenir stores of interest. Here you will also find the popular Irish Pub complete with a real Irish owner. Across the street (to the side of the cathedral) are several other cafés popular among tourists: Cafe 24 and Lorca Café (the best - has great live music and entertainment every weekend). See more about shopping here and more about cafés, bars and restaurants here. The Northern side of the plaza houses the Bank of Argentina and several other government offices including the Santa Cruz Tourist Information Center. Along this sidewalk (Junin/Bolivar Street), just a block to the West is the city’s main post office (Correo Nacional) across from which you’ll find bookstores, jewelry stores, souvenir shops and international newspaper stands along with the Regional History Museum (Museo de Historia Regional) which is quite cool indeed. On the Western side of the plaza you’ll see the Casa de Cultura next to the Cine Palace (the city's first movie theater). This is Colon/Independencia Street. This “House of Culture” is run by the city tourism office and municipal government and there are always interesting art exhibits and you can learn about the local culture and indigenous groups. It also has an art gallery and sometimes there are music recitals and orchestras so be sure to ask at the office as you enter. The exhibits often spill out onto the sidewalk or plaza and some are organized as competitions. Four blocks southwest of the plaza is 7 Calles. This is a massive outdoor market that covers several city blocks. Here you can find anything you need from toiletries to clothing and shoes, souvenirs, groceries and many MANY tailors. There are several small and very inexpensive hotels in this area. By the way, there are only 6 streets and I don’t know why it’s called 7 Calles (7 Streets). Two blocks up from 7 Calles toward Mercado Street you’ll find a small brightly painted, straw-roofed building. This houses Artecampo, one of the most popular souvenir shops for tourists (and always a stop on the guided city tours). All proceeds from the handcrafts sold here go back to the artisans that make them (they are more expensive than in other stores but are not sold for profit so you know you’re contribution is truly benefiting the artisans and their families). They are very beautiful and are brought in from all over the nation. If you walk straight North from the plaza (from Shopping Bolivar on Calle 24 de Septiembre Street about 8 or 10 blocks) you’ll arrive at one of the tallest buildings in Santa Cruz. This is the blue-glassed Palacio de Justicia (Palace of Justice, the Santa Cruz higher courts building). You’ll have to show your I.D. as you enter, but you can take one of the elevators or, if you’re up to it, you can walk up to the top floors. The stairwell is completely glassed in and gives you the chance to take photos of the city from a high point. This is not a usual stop on the guided city tours - it'll just be our little secret! Don't dress too "touristy" or they'll catch on and not let you in. 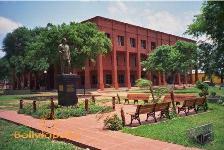 Straight across from the court building is a 3-story brick building with a small attached plaza called Plaza del Estudiante (Student’s Plaza). 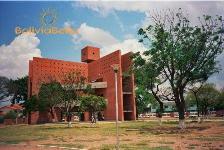 This is the city library (Biblioteca Municipal). It also has a few small offices inside, like the office used by the group that organizes the annual Film Festival. If you read well in Spanish, you can spend some time here being a bookworm. At this plaza, and running North of it for 3 blocks straight up to the famous statue of Jesus "El Cristo" is a street called Monseñor Rivero. The entire street is lined with bakeries, bars, cafes, and other eateries. This is one of the most popular night spots in town among grown-ups. It’s one of the city’s social focal points and a great place to spend an evening watching all the socialites “cruise” the avenue. It can be quite congested, but is located precisely between the 1st and 2nd concentric rings so if you take a taxi to get there, you can easily walk up and down the main thoroughfare from there. Equipetrol is another hot nightlife spot and you'll find much more downtown nightlife on this page. In Equipetrol, Avenida San Martin (the main avenue that cuts through the Equipetrol neighborhood) is transformed into a brightly-lit, colorful, and noisy unending row of chic night spots with bars and cafés and discotheques one after the other (well, OK it's not unending but it does go on for about 6 blocks on both sides of the street). This is also "Hotel Row" where you find many of Santa Cruz' best Hotels (Hotel Yotau, Hotel Tajibos, Hotel Camino Real, Hotel Caparuch, Hotel Casablanca) and is one of the city's wealthiest neighborhoods. Perhaps you’d rather spend your day at a park. Santa Cruz has plazas and parks all over the city. 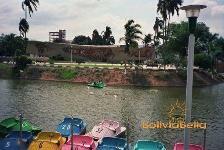 Parque Arenal (Arenal Park), about 10 blocks East of the plaza has a small lake and little colored paddle boats. It was remodeled in 2009 and is slated to become another Monseñor Rivero or Equipetrol with cafés abounding and a beautiful new clean lake. 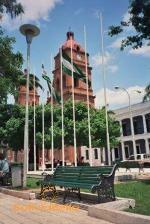 In southeastern Santa Cruz, about 15 blocks from the central plaza is the Parque Urbano (Urban Park). This is a large, sprawling park where concerts are sometimes held. On Sundays there are small fairs with rides and cotton candy and other snacks for children. There is also a running track that circles the entire park. On one corner of the park you’ll see a tall brick “building” that is actually a lookout towers. About 10 blocks straight South of the plaza you’ll come to Plaza Blacutt (one block down from Irala Avenue). This covers an entire city block and is a nice place to just lounge and relax. There is a large grocery store here, a huge bowling alley (Galaxy Bowling) and many other small eateries all around the plaza and is a nice place to spend a Sunday afternoon. Two blocks West of here you’ll come upon our huge soccer stadium (Estadio Tahuichi Aguilera) where the regional and national teams play against each other. If you don't like crowds avoid it on Sunday and Thursday nights. If you prefer to spend your time watching animals than people, one of our best parks is probably our zoo (Jardín Zoológico). For a small entrance fee (about $2) you can see all types of endangered tropical species including jaguars, macaws, many snakes, monkeys and other interesting animals. You can walk around easily with children and strollers, there are many benches to rest on, and several vendors who sell toys and snacks. Sundays get hectic – it’s a major family outing on Sundays, but during the rest of the week there is usually no line at all to get in. Even though it recently underwent massive remodeling don’t expect this to be as luxurious as a U.S. or European zoo. Volunteers are doing the best they can. Most of these animals are rescued from people who thought they would have them as pets (stupid!) and when I was little, this zoo was nothing more than a row of wooden and steel-barred cages lined up on tables on a street, so things have improved quite a lot! City tours don't usually take you here but they might drive by it. You won't see anything that way as the entire zoo is circled by hedges. If you’re willing to get a bit sandy, you can visit the Cabañas del Río Piraí (Cabins on the Piraí River). This is a long dirt road lined with small palm leaf-covered huts on either side where you can taste delicious local baked items at tea time. The road ends at the river which, during the rainy season, will swell to great depths and will not have a beach. During the dry season the river very wide and so low you can almost walk across it (however, even if the water is low the currents are strong) and there are places where the sand is mucky and feels like quicksand so you should always be very careful where you step. You can enjoy an afternoon here, rent a 4-wheeler to scoot around on, or hire a skinny pokey-rib horse for a short ride. On Sundays this gets very congested and I suggest going here with one of the guided city tours for your safety, only because unfortunately, hundreds of young people like to come here and there is sometimes an issue with drug use and muggings, especially if it's not crowded. The “cabañas” rest on what used to be the city’s famous Jardín Botánico (Botanical Gardens); however, in the 1980’s a great flood washed it out and completely destroyed it (along with several entire neighborhoods including Equipetrol). You can now visit our new and even more beautiful Jardín Botánico located straight East of the city on the road that leads to Cotoca. And why not make a day trip out of it? Visit Cotoca too! If you’d like a bird’s eye view of the city, you might want to head for the El Trompillo Airport where several helicopter service companies have their hangars and some offer airborne city tours. For a sort-of-high price, you can take a whirl over the city and get some spectacular photographs of the city and its famous concentric rings. It’s worth it! You’ll get an amazing view of the sierras to the West (which is why Santa Cruz is called Santa Cruz de la Sierra). Check out my tourism and ecotourism sections for other nearby destinations and my things to do section for descriptions of many more fabulous places to visit and forms of recreation. You'll also find LOTS more in my pages on parks and gardens (including water parks, swimming pools, city parks, etc.) and museums (which includes a listing of art galleries too) - nearly 40 in all! Before making your travel plans, get more information on restaurants hotels, events, holidays and transportation. If you plan to live here we’ve got lots of ideas and special tips for you too! This is just a super short list of places to see. Be sure to check out my super LONG page on the Top 100 Things to Do in Santa Cruz. 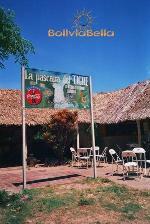 Throughout Santa Cruz you’ll see signs that say “Es Ley del Cruceño la Hospitalidad” (Hospitality is the Law in Santa Cruz). I know you’ll find that to be true!